The Good of Goshen project, a compilation of videos and stories documenting the lives of the people and businesses of Goshen, began in June. The project is the result of a combined effort between Goshen College, the City of Goshen, Goshen Chamber of Commerce and Goshen Community Schools. FiveCore Media at Goshen College was subcontracted by Eyedart Creative Studios to film the short videos. 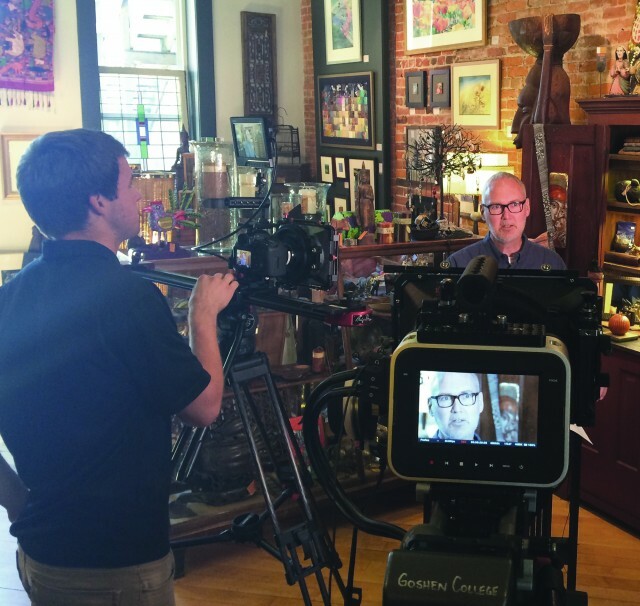 According to Kyle Hufford, general manager of FiveCore Media, the purpose of the videos and stories are to strengthen the image of the Goshen community by examining the good things Goshen has to offer. These videos and stories focus on outstanding groups and individuals in the community—schools, teachers, unique businesses and individual business owners—who give back to the community. The stories were picked by each of the four contributing institutions and then narrowed down to what would be videotaped and displayed on the website. Twenty videos will be released one at a time in intervals throughout the year, ending in May or June of 2015. While there are no plans for these videos to be compiled into one, they will be available for all to see on the website. While it may be hard to quantify how the project affects Goshen in the short term, the hope is that there will be a quantifiable difference in the community in several years. Hufford also mentioned the great opportunity the project presented to the Goshen College students working on the videos. Not only do the students get to work on a professional, external campaign, but they also get to interact with and provide a service to the community. Jared Zook, a senior, said that the best part of the experience has been this interaction with the community. The videos and stories can be viewed on goodofgoshen.com.